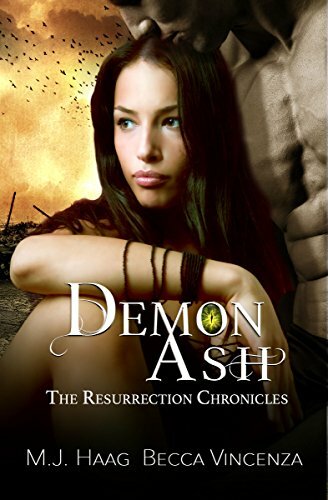 Demon Ash, Resurrection Chronicles series book three. Written by M.J Haag and Becca Vincenza. She is back on the surface and the world around her is nothing like she remembered. The cities are bombed and burned to the ground, they tried to kill the Hellhounds and the plague of zombies. Only it didn’t work, there are still hellhounds roaming the earth and the zombies are smarter. How will they survive this new world and find her family, if they are still alive. Drav his whole family is now on the surface and are protecting Mya. She now knows the truth about them and needs to convince the other humans that they aren’t all bad and that the Fey can help them survive this. Will she ever be safe, back with her family and will her new family be accepted by the humans or will there be nothing left to fight for. This is the last book from Mya and Drav’s story, there is another book in the series about a different girl. I can’t read that, because I like to keep the books with one MC or the same main characters. So I think I wait for a few weeks and pick that book up when I have no idea what to read. Because I really love these two writers, the books are great, well written and fun to read. I like how the fey are and that they never have seen a woman and how they learn to live above ground. I didn’t like how the book ended. There are a few books with great endings, I always find that the endings feel like they are finished in a hurry and this one was kind of weak. Because the all got together happy ever after, which is great don’t get me wrong on that part. I didn’t like that the ending was written in a few chapters, they could have made the ending bigger. That is the only thing I didn’t like about the books. You would never find out that the book was written by two people and that is great, you don’t have two different writing styles in it and it flows together. Good job to the writers for getting me hooked to these books, while the books are full of zombies who get creepier every single time.